Merida, Belle and Cinderella have put a new spin on playing spin the wheel. 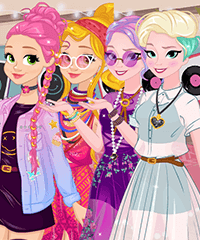 They are using it to dare each other to dress up in the styles presented on the wheel: Pokemon, Fairy and Mermaid. And you know the golden rule of spin the wheel - there is no changing your mind if you don't like the trend you get!